Hello from Sevilla, España! Two weeks ago, I left my beloved hometown of Montreal and headed to Spain. I wanted to do something different for a bit. After everything I’ve been through in the last two years, I realized that life’s too short to stay in one place. I applied to a work-study program that would allow me to do some of the things I loved most: work with people and help them improve their English communication skills, learn about helping others become better communicators, immerse myself in a new culture, and explore different cities. Three interviews and loads of paperwork, running around and late nights, I was accepted and got offered a position in Montellano, Spain. I flew to Malaga, a beautiful port city in the south of Spain. 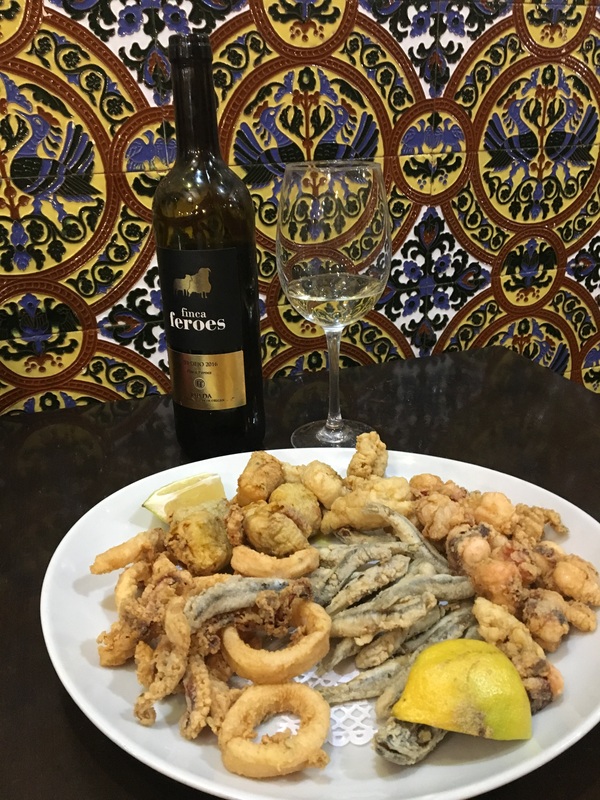 I spent two days strolling down the marble streets in the city centre, enjoying the waterfront views, and finding awesome food deals like a whole platter of deep fried seafood plus a whole bottle of wine for 20 Euros. 20 Euros! 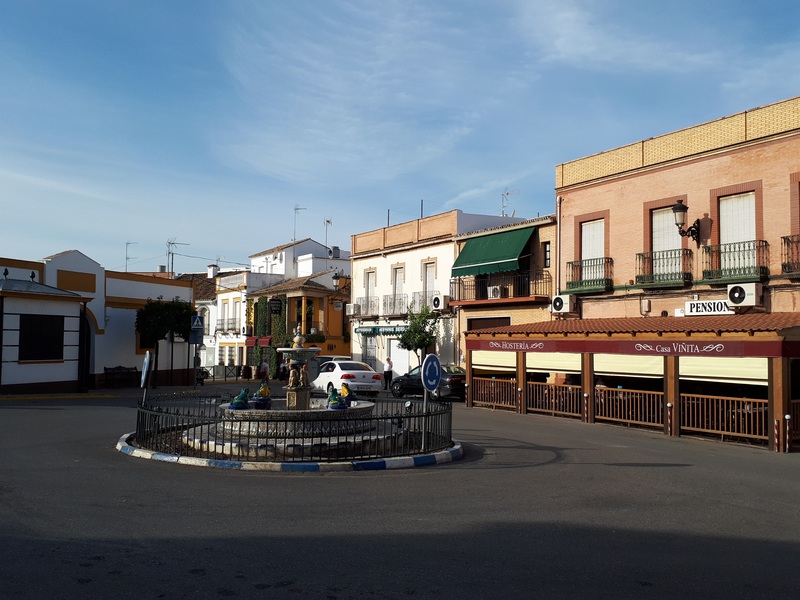 Then, it was time to head to Sevilla, where I would catch the bus to Montellano, which is about an hour an half away. When I arrived in Montellano, I asked the bus driver if he knew where I could find a taxi. He said something which I didn’t understand (that happens a LOT here), and then motioned for someone to call a taxi for me. The taxi got there in less than 5 minutes, and 5 minutes later, we got to the hostel that I was going to stay at for the week. When we arrived, the taxi went straight to the hostel bar for a few minutes, then came out and motioned for me to come in. He led me to the bartender, and I quickly realized he was the owner of the hostel. This was a weird place; a hostel with no front desk. I would never have guessed that to check in, you have to go to the bar! Just before he left, the taxi driver gave me his business card and told me that he was one of the two taxi drivers in town and that I could call him if I needed a lift anywhere. In Montellano, there are only two taxis! I checked in and headed out to explore the town. Montellano is a small village with a population of around 7500 people. They are mostly older people, with a few young families. No one speaks English, so people like me are very much in demand. I stopped someone to ask if there were any grocery stores that were open. He explained to me that everything closes on Saturdays and Sundays. The main grocery store opens for about 2 hours in the morning and two hours in the evening on Saturday, but other than that, there would be a few bars open. Main plaza in Montellano…if you can call it a plaza! I walked along and some kids called called out to me from across the street. “Chino?” they asked. I told them I was from Canada, and they asked me about the weather there. I then realized that they hardly got any foreigners in this town, and people here knew nothing about cities other than their own. People stared at me everywhere I went, and one person even asked if I ate dog! It took less than an hour to walk around most of the city, which was a bit scary because there were hardly anybody on the streets. I felt very uncomfortable there, and didn’t know whether I should stay there. When I was hired, the recruiters made it sound like a vibrant little town from which I easily get to the city. But the bus schedule wouldn’t allow for this, especially on weekends. Panicking, I turned to social media to see what others would do in my situation. I received a lot of supportive comments and messages, which led me to run away from Montellano the next morning. I then found myself in Seville with no job and no place to stay at, so once again, social media saved me. I joined every Facebook group I thought could help me and connected with everyone who responded to my “I ran away from my job and I need your help” posts. A gentleman was kind enough to put me in contact with the director of the English Academy he worked at and told me she was hiring an English teacher. I got an interview the next day, and upon hearing my story and seeing my skills, I was hired right away. I felt bad for leaving the position in Montellano, especially since they offered a great work-study program, but I really didn’t feel safe. What would you have done if you were me?